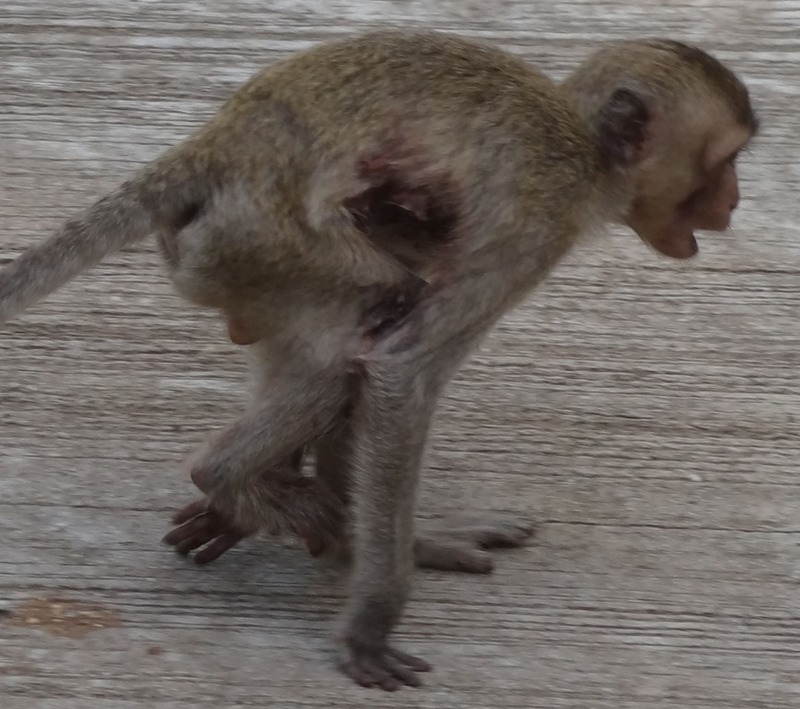 We try to keep a photographic record of injured monkeys. In theory it is much easier to track the movements of such monkeys than to track the far more numerous and difficult to distinguish healthy, unharmed monkeys. 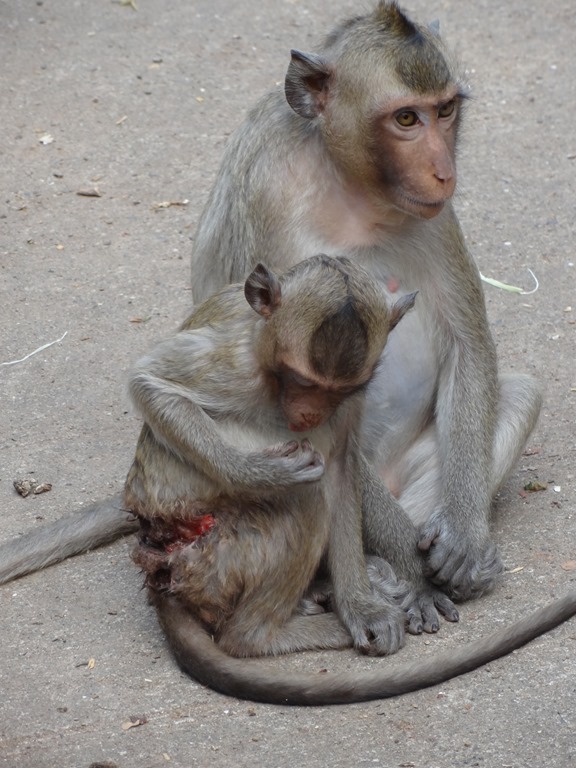 In practice, though, we often lose sight of injured monkeys for quite long periods of time and have just about given them up when they reappear. 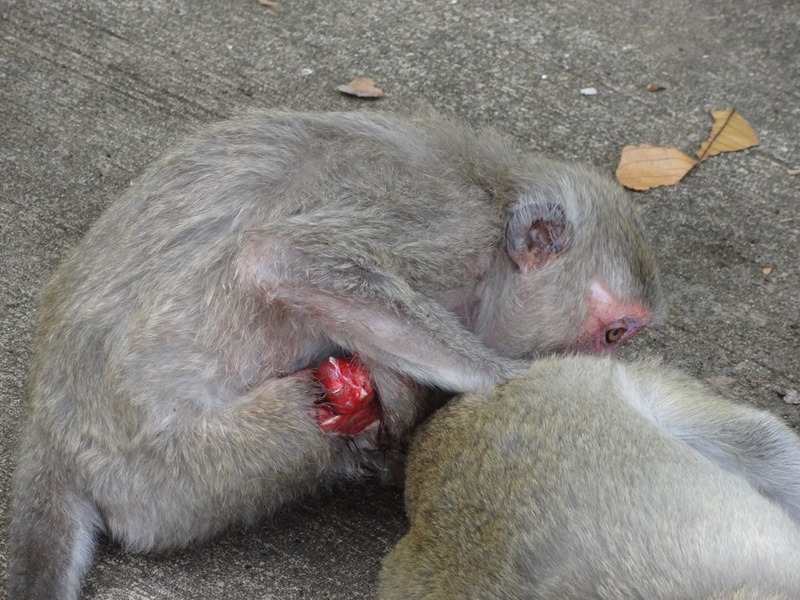 It seems to be the case that our monkeys are able to survive what look like horrendous injuries despite the only treatment they get is self-licking and more grooming and comfort than they would normally receive. Here I am going to give some of the more extreme examples of injuries we have seen since the start of this year. We are certain that most of them have survived and are now well past the time when infection might set in. Just one case, I think, has probably resulted in a fatality. Many of the nastiest injuries have almost certainly been inflicted by a dog and most likely by just one dog. The monkeys are well aware of dogs they can trust and they are usually well aware of strange dogs and the one or two which come into the forest with the intention of hunting. 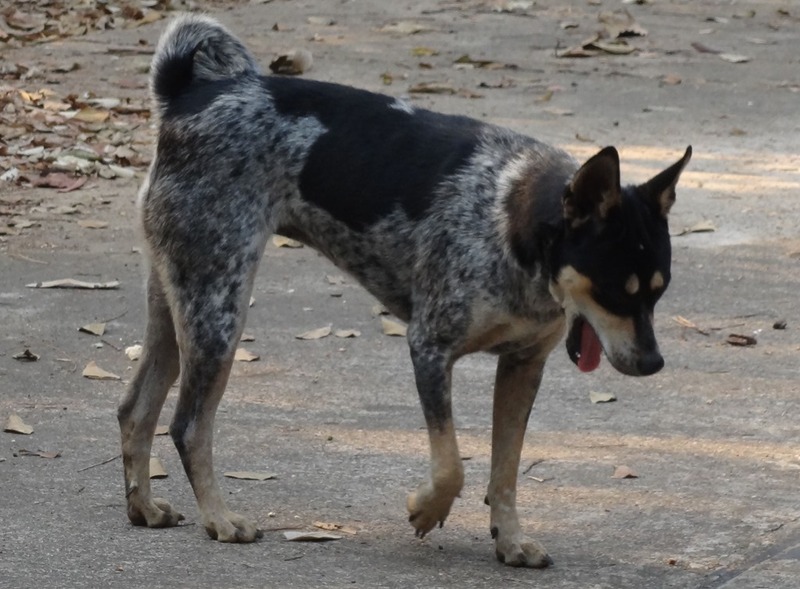 But although they mostly flee into the trees at the approach of the one ‘killer’ dog which makes a frequent appearance in the forest, I have seen them behave somewhat recklessly, leaving their ascent to the very last minute. The injuries which follow are probably the result of just that sort of recklessness. 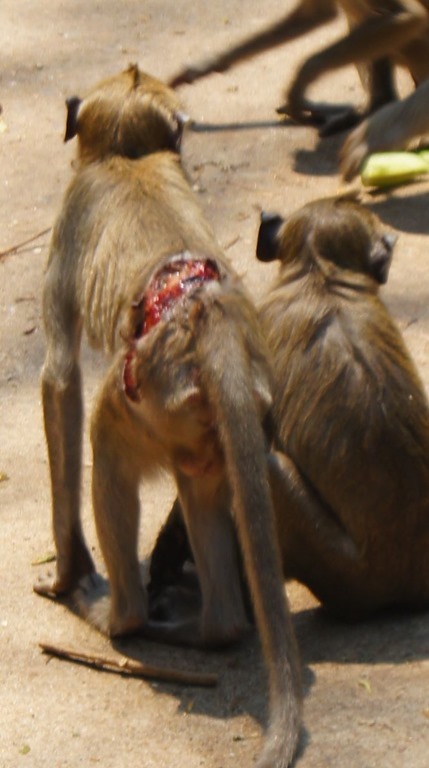 The monkey on the left is not the same one as in the centre and right pictures, but the injuries are very similar. They both suggest dog because of their size and position. These next two are large wounds but their positions make it unlikely that they were inflicted by a dog. 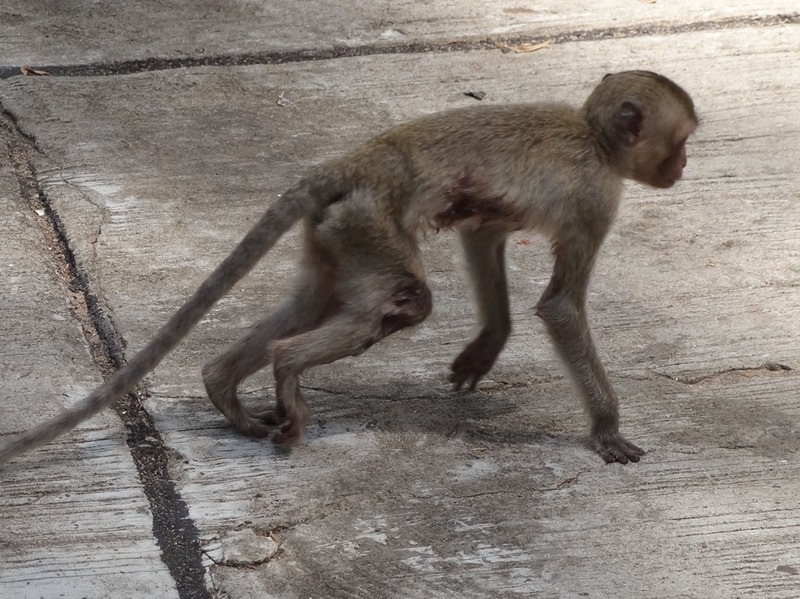 This monkey, on the other hand, does look as if it was severely savaged, and we remember seeing (but not photographing) him much earlier when the wounds were still raw. We had not expected him to survive and now suspect that despite getting to this stage, he did finally succumb. 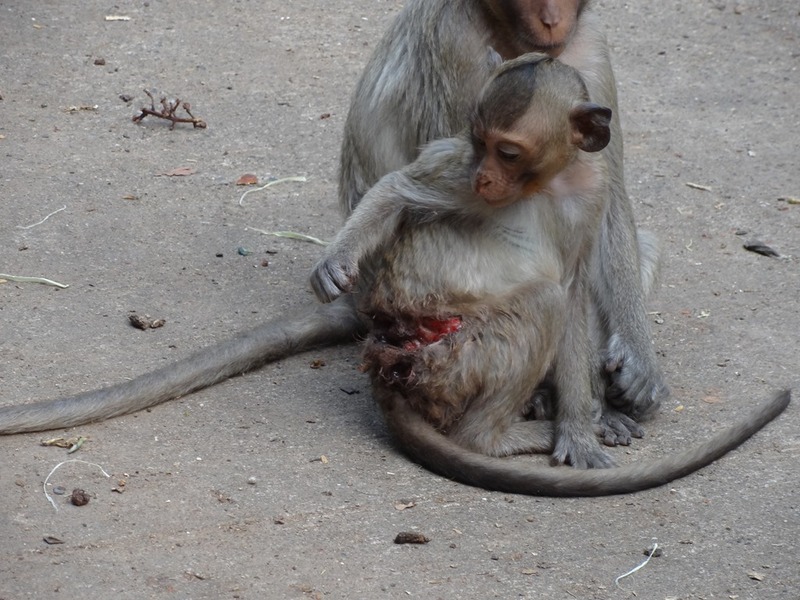 Of all the injured monkeys I have seen, he is the only one which has seemed to communicate pain, as he was doing in the picture on the left. And here is the chief suspect. He runs through the forest fully focussed on spotting a vulnerable monkey, and spreading terror wherever he goes. I have been in and around North-East Thailand for more years than I can recall. I now live here permanently. I have travelled in 32 countries on 3 continents (Europe, Asia, Africa) so I am a bit of a traveller. 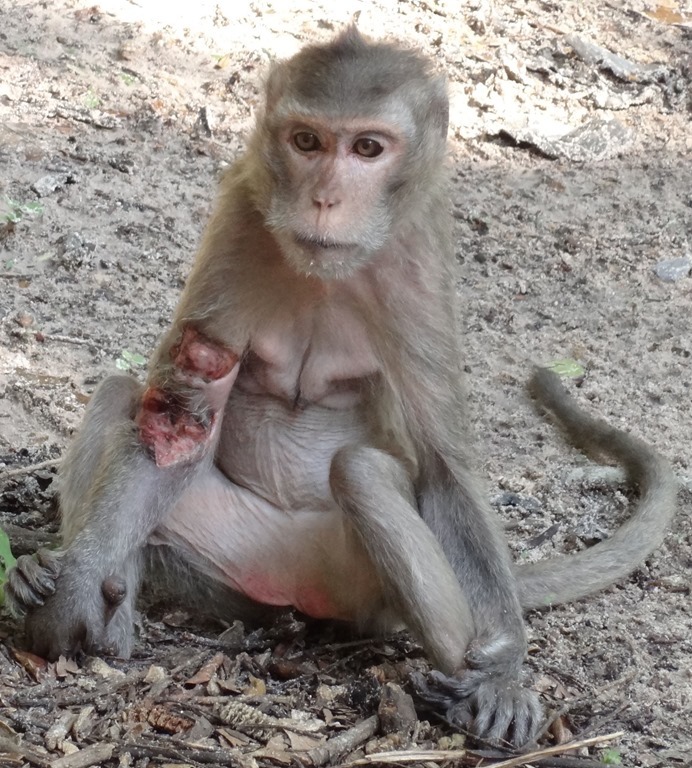 This entry was posted in injured monkeys, Long-tailed Macaques, monkey forest, Monkeys, Phana Monkey Project and tagged injured monkeys, Long-tailed Macaques, Thai forest, Thai monkey forest, Thai monkeys. Bookmark the permalink. Lawrence, some horrible injuries, I am suprised they survive given the infections possible. Dogs and Thailand…… you can’t really blame the dog, but proving ownership and getting some action would be impossible. It may seem heartless, Mike, but in many ways we should be grateful that this dog (and others that guard rice fields and orchards) performs the role of predator to this very pampered group of wild creatures. This site is a member of WebRing. Browse Rings.